The New Pension System or the NPS scheme is a government pension scheme for the Indian Citizens. After the declaration of 2016 budget, NPS Tax Benefits created lots of confusion! The central, as well as state government employees, need to subscribe for NPS which is compulsory for them while it is optional for other employees. NPS introduced in 2004 for the government employees but extended for everyone in 2009. NPS scheme simply gets defined as a contribution pension plan, and the subscribed employees must keep contributing till the age of 60 years. Do you know the tax benefits of NPS during investment? Every investor must have the idea about the tax benefits before investing! The tax benefits are available through the three sections, i.e. 80CCD(1), 80CCD(2) and 80CCD(1B). The tax benefits, exit, annuity restrictions, and the withdrawal rules are only applicable to the NPS Tier-I account. The NPS Tier-II account is an open-ended mutual fund that allows the investors to withdraw money anytime. The NPS subscribers can claim the tax benefits. Learn about different sections of NPS to claim tax benefits. 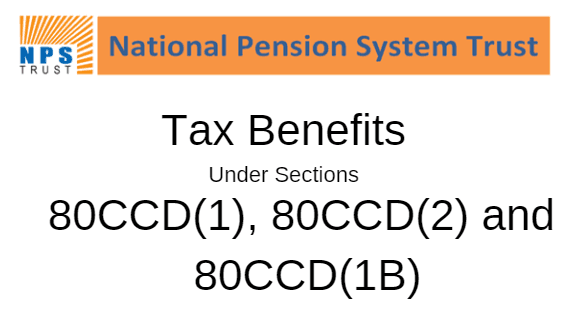 You can claim the contribution to NPS under the section 80CCD(1B) and Section 80C. Let's learn more about different sections in detail! The employees have to contribute 10% of their basic salary. The dearness allowance – DA of the employees up to 1.5 Lakh is eligible for the tax deduction. The contribution of the employees along with the Section 80C has up to 1.5 Lakh investment which is eligible for tax deduction. Self-employed individuals can also claim the tax benefits under this section but the limit is 10% of the annual income, and they can claim a maximum of up to 1.5 Lakhs. The employer's contribution under this section is up to 10% of the basic salary along with DA will be eligible for tax deduction. The contribution or the investment of the employers is the additional deduction as it is a part of Rs 1.5 Lakh eligible under Section 80C. The employers can claim tax benefits for their contribution. The employers need to show the business expenses in the profit and loss account statement to claim the benefits. Self-employed can't claim the tax benefits under this section. Under this section, additional exemption up to Rs 50, 000 for investments in NPS will be eligible for tax deduction. The taxpayers included in the highest tax bracket of 30% can easily save Rs 15000 by investing Rs 50000 in NPS. The taxpayers in the 20% bracket will save around Rs 10000, and the taxpayers in the 10% bracket will save Rs 5000 annually by investing in NPS. The tax benefits are irrespective to the type of employment. The government employees, private sector employees, self-employed and the ordinary citizens can claim the tax benefit of Rs 50000 under the section 80CCD(1B). The investors need to choose after learning about the tax benefits under different sections.